I figure I best get to it if I'm going to write about all of our adventures. Day one which now seems like a lifetime ago was spent traveling from Raleigh Durham to Chicago, Illinois and then a red-eye flight to Brussels Belgium. With a 5 hour layover in the Windy city, I asked around as to what's the best place to eat at the Chicago airport. I kept getting the same advice. Go to Gold Coast Hot Dogs. 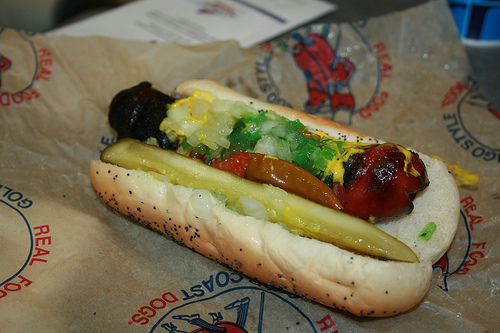 It's the #1 rated hot-dog in Chicago and there's one right at the American Eagle terminal in Chicago. Better yet if you're flying in American, going over to the "Eagle" wing is a quiet off the beaten path place with less noise and lot's of seats. So what is it that makes a Chicago hot-dog special? Surely it's just a hot-dog? No? No. I had never had one quite like this. They put a full uncut dill pickle on the bun. Poppy seed bun, pepper relish, tomatoes, mustard, jalapenos and more. It's the most unique hot-dog I've ever had. My favorite part was the huge signs that forbid ketchup. A warning I give in my own house yet goes unfollowed. I like these people.... they get the hot-dog. Oh and don't forget the cheese fries. Their cheese has this sort of sweet aftertaste unlike anything I've ever had before. Super good. 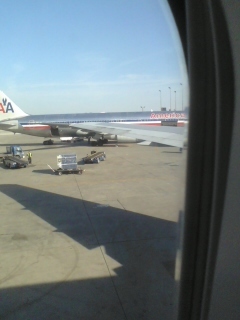 So after cramming down a hot dog and fries we walked about the Chicago airport. After accomplishing gastronomical success we scurried along to a few of the sights (Abe, classic airplanes...) within the airport before boarding to Brussels. It was a long day of travel, followed by a long night of travel. 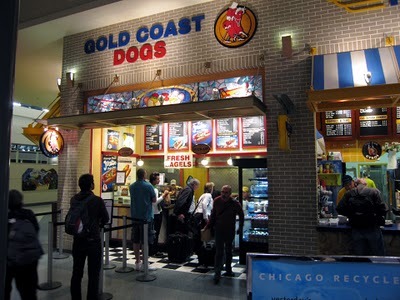 It was the beginning of the most wonderful journey- one that was made better by the best place to eat in the Chicago airport: Gold Coast Dogs.